Chewy and flavorful yard long beans, also known as Chinese snake beans, are closely related to black-eyed peas. Its immature, tender, edible pods are one of the most popular pod-vegetables used in the Philippines and other East Asian cuisines. The beans are also grown in small scales in the home gardens in the Southern United States, West-Indies as well as in the Mediterranean regions. The yard long pods are actually legumes belonging to the Fabaceae family. The beans were thought to have originated in southern Chinese Yunnan province. Scientific name: Vigna unguiculata, sub. sesquipedalis. Some of the common names include asparagus-bean, string-bean or Chinese snake beans. The beans in general recognized by local names as bora (West Indies), dau gok (China), pole sitao (Philippines), etc. Photo courtesy: scott.zona. Yardlong bean pods in a home garden. Yard-long bean is a fast growing annual plant; require a trellis to support its growth. Dwarf and tall climbing varieties exist. Depending upon the cultivar type, it bears blue to violet flowers after about 6-10 weeks of the seedling. Numerous pencil thin, tender, light-green, flexible-textured pods appear after about another two to four weeks following flowering. These fleshy, pendulous pods are usually harvested while they are immature and eaten as green vegetables. The pods vary in length that ranges from 30 to 80 cm. As in other bean varieties, harvesting may not be a time-guided event. The pods harvested early in order to gather young, immature-beans, or they may be left on the shrub to dry to get dried beans. Yard-long beans are one of the ancient cultivated crops. Young, immature pods are one of the very low-calorie vegetables; 100 g beans contain just 47 calories. The pods contain large quantities of soluble and insoluble fibers. Since the entire green pod is eaten as in green beans, sufficient amount of dietary fiber is obtained in the diet. Dietary fiber helps to protect the colon mucosa by reducing its exposure time to toxic substances as well as by binding to cancer-causing chemicals in the colon. Fiber rich food also found to reduce LDL-cholesterol levels by decreasing reabsorption of cholesterol binding bile acids in the colon. Fresh yard-long beans are one of the finest sources of folates. 100 g beans provide 62 µg or 15% of daily requirement of folates. Folate along with vitamin B-12 is one of the essential components of DNA synthesis and cell division. Adequate folate in the diet around conception and during pregnancy may help prevent neural-tube defects in the newborns. Fresh beans contain a good amount of vitamin-C. 100 g yard-long beans provide 18.8 mg, or 31% of vitamin-C. Vitamin-C is a powerful water-soluble antioxidant, and when adequately provided in the diet, it helps build immunity to combat infections, contribute to maintaining blood vessel elasticity, and offer some protection from cancers. Furthermore, the long beans are excellent sources of vitamin-A. At 865 IU per 100 g; the beans have more of this vitamin than that of the other same family legumes such as lima beans, fava, green beans, etc. Vitamin-A is one of the essential vitamins for the body provided through our diet. Vitamin-A maintains mucosal integrity, enhances skin complexion, and improves night vision. Also, yard long beans provide average amounts of minerals such as iron, copper, manganese, calcium, magnesium. The body uses manganese as a cofactor for the important antioxidant enzyme, superoxide dismutase. Light green color fresh yard long beans in a market. Photo courtesy: Gary Stevens. Yard long beans generally harvested while the pods are at their immature stage, just before to full development. Hence, they tend to perish early if kept open for a few hours. In the farms, the beans transferred to cold storage facilities soon after harvest. Fresh, tender beans can be readily available year-round in the farmer markets all over Asia. In the USA, however, you may find them in selected markets that specialize in Asian/ Cantonese vegetables or some supermarkets supplying them from the West Indies. They generally sold in loosely tied small bunches. Choose smooth, firm yet flexible, fleshy, long and uniformly green immature pods. Avoid mature, tough, flabby, yellow or shriveled pods as they indicate old stock, and hence, out of flavor. Once at home, treat them as you do for French or green beans. Store in a plastic bag and place in the refrigerator set at optimal humidity where they stay fresh for 2-4 days. Young yard-long (asparagus) beans generally cooked like vegetables. To prepare: swish the beans in a bowl of fresh water. Mop them dry using a paper towel. Trim the ends. Cut the beans into desired lengths using a paring knife. Yard long beans feature in almost all the parts of East Asian cuisine. They impart unique beany flavor in the dishes. Very tender, raw yard long beans can be eaten in salads. Sautéed or steamed, they can be served as a side dish with fish, seafood, and poultry. Braise the beans with fish sauce, Chinese fermented black beans, chili and soy sauce is a classic Cantonese style cuisine. 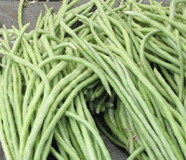 In India, where they are popular as phali or chavali, long beans used in a variety of dishes ranging from stews, curries, sabzi, fried rice, rice pilaf, etc., with other vegetables like onion, garlic, potato, green bean, carrot, cabbage, etc. 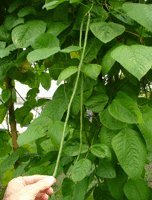 Yard long beans and plant parts can be safely consumed by all healthy persons without any reservations. However, individuals with known immune-allergy to legumes and in G6PD-enzyme deficiency disease (favism) should avoid eating them. (Medical disclaimer). <<-Read Sugar snap peas nutrition facts and health benefits. <<-Read Fava beans nutrition facts and health benefits. <<-Back to Vegetables from Yard Long Beans. Visit here for an impressive list of vegetables with complete illustrations of their nutrition facts and health benefits.